I wouldn't jump to that conclusion just yet. Carb cleaner evaporates very quickly. With it being sprayed so close to the carb inlet I would imagine that a good amount of the solvent gasses are getting ingested through the air filter into the carb body displacing oxygen and killing the saw rich. The only way I can think of to know for sure would be to, somehow, attach a runner tube on the inlet side of the carb that is a foot or more long to insure the engine is only breathing standard air when you spray the base with solvent. I, actually, doubt you have an air leak there if the gaskets look good. I remember the gaskets felt really gritty and oily. I had been questioning the seal. I might replace them just to be sure. So I rebuilt the carb and replaced the carb gasket. I checked all the fuel lines and all are clear. Now I can't get it to even start up. It has spark. It has fuel flow because it will flood. 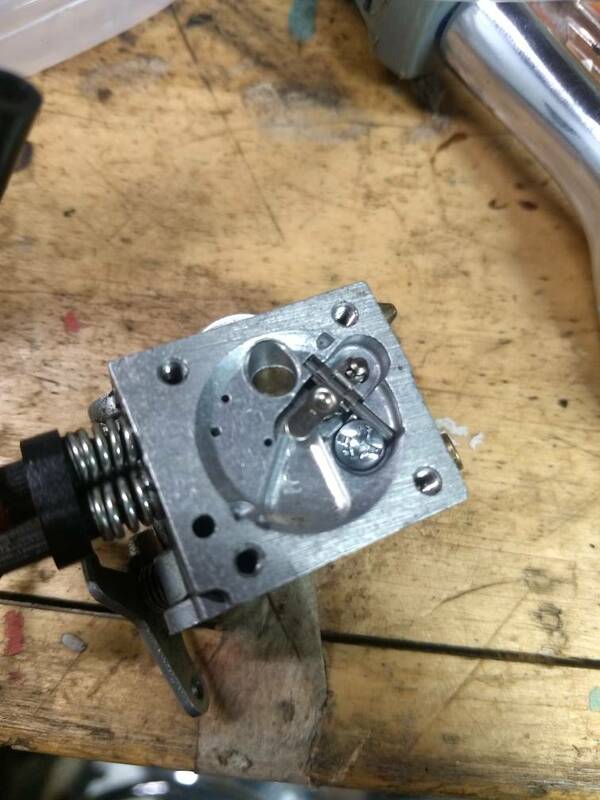 Below are pictures of how I assembled the metering needle. Any thing look off? I sprayed the ports with can cleaner and compressed air before reassembling. Looks like you might need to lower the metering lever a bit if I'm seeing it right. On the metering side put the gasket on first, then the diaphragm. The gasket goes on last on the pump side. If it seems to still run rich you can always turn in the H and L screws a bit, maybe an eighth turn and see how it does..also, don't leave the choke on too long or it won't start..
How do you adjust the metering lever? You have to bend the lever a bit. Be careful not to mash the needle into the hole. 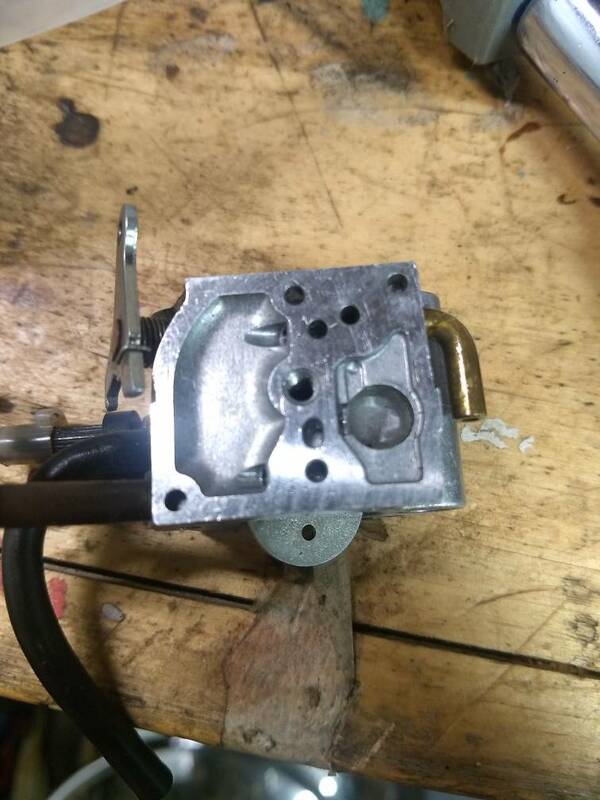 The metering lever should be even with the nearest ledge on the carb casting. It looks like yours is up near the gasket surface. Yes you have to bend it to get it there.. Thanks for the replies. These homelite saws aren't exactly easy to get to the carb. Where do you set the idle screw to start with? Last one of these I worked on I started with 1-turn out on both H and L (simply because I didn't know where to start either). That got the engine to start. Then I adjusted L to get a good idle and afterward adjusted H to get a good run in the cut. Sorry, but I didn't check to see where I was when I finally had it tuned. You can probably remove the carb without pulling the engine out of it but engine pull isn't all that hard, just takes a little more time.. In reviewing the 2 linked documents. I can't tell if my carb is figure a or figure b. I also, realized i replaced the welch plug, put didn't need to. Can anyone tell from the photo if the welch plug looks right? Yours looks like it would be figure b. Align the lever with the nearest ledge on the carb body, if it sticks up your saw will run too rich, if it sticks down then too lean. You can compensate a bit with the H and L screws but best to adjust the lever correctly.